The 1001 Superwords and phrases are presented in context in a variety of friendly formats, so learning them is fast and students have fun. Using this course book will quickly increase students’ working vocabulary so they will be able to perform much better in all English language tests that require a high level of word recognition and use. Published by a leading IELTS publisher in Australia, this is no dull and boring academic book. The language to practise is essential for any student who wants to communicate either verbally or in writing at a consistently high level. Activating 1001 Academic Words for IELTS provides students with words and phrases taken from university headlists and texts. 1001 Superwords and phrases in 25 lessons. Multimedia CD-ROM with full printout capability. 25 revision lessons with crosswords, hangman, wordfind games, spelling practice. 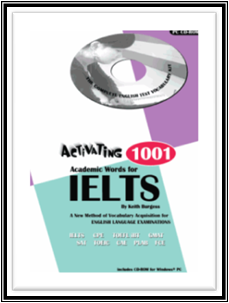 Activating 1001 Academic Words for IELTS, has been authored by Keith Burgess, our outstanding teacher, from materials he has developed specifically to respond to real life students’ needs in the classroom.